The TTC will be conducting a rail repair to a short section of track on King Street West just south of the Queensway/Roncesvalles/Queen intersection. The overall rail repair will include replacing rail, welding, grinding and placement of concrete. Starting at approximately 8 a.m. on Saturday, January 31 a crew will begin breaking and removing the concrete in the track area to expose the rail for repair. This portion of work will be carried out during the daytime. Once the section has been excavated, a new piece of rail will be installed and welded. This work will be completed by 10:30 p.m. Saturday evening. Concrete placement will follow on Sunday morning. While efforts will be made to keep noise levels to a minimum, noise will be unavoidable when certain equipment is in operation. 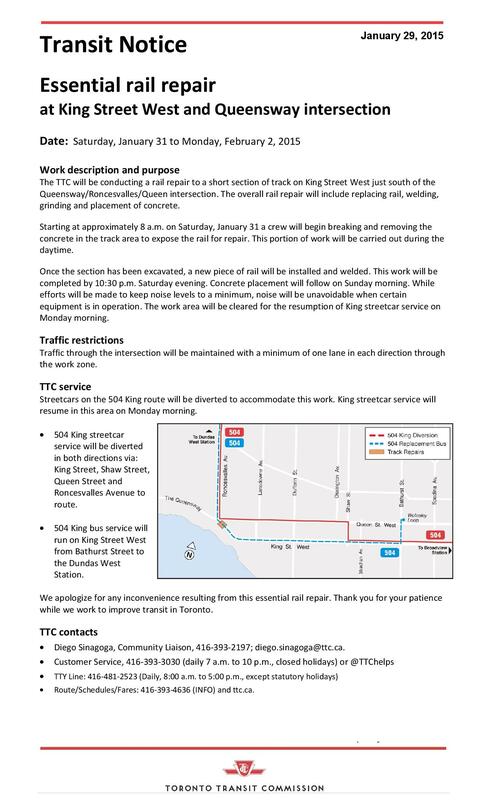 The work area will be cleared for the resumption of King streetcar service on Monday morning. Traffic through the intersection will be maintained with a minimum of one lane in each direction through the work zone. Streetcars on the 504 King route will be diverted to accommodate this work. 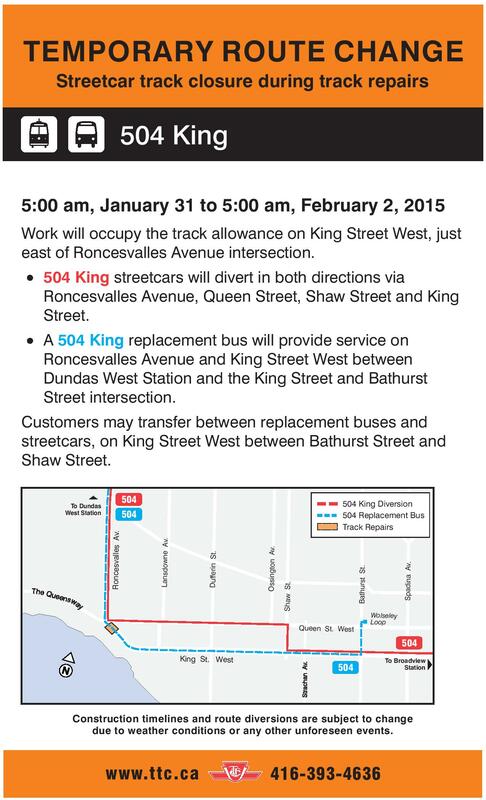 King streetcar service will resume in this area on Monday morning. – 504 King streetcar service will be diverted in both directions via: King Street, Shaw Street, Queen Street and Roncesvalles Avenue to route. – 504 King bus service will run on King Street West from Bathurst Street to the Dundas West Station. – Diego Sinagoga, Community Liaison, 416-393-2197; diego.sinagoga@ttc.ca. 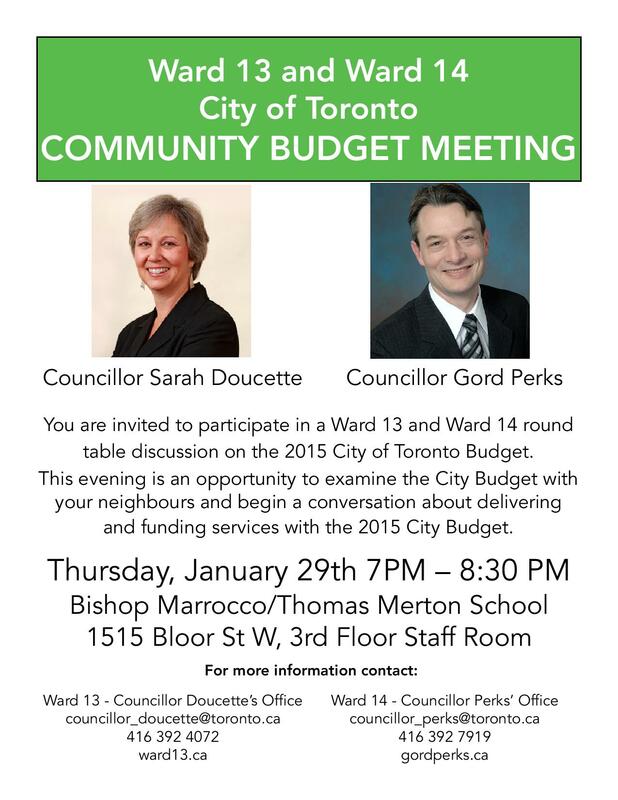 Tomorrow night, January 29th, 2015, I will be hosting a Community Budget Meeting with Councillor Sarah Doucette at Bishop Marrocco. You are invited to participate in a Ward 13 and Ward 14 round table discussion on the 2015 City of Toronto Budget. This evening is an opportunity to examine the City Budget with your neighbours and begin a conversation about delivering and funding services with the 2015 City Budget. The last Thursday in January (January 29th, 2015), I will be hosting a Community Budget Meeting with Councillor Sarah Doucette at Bishop Marrocco. 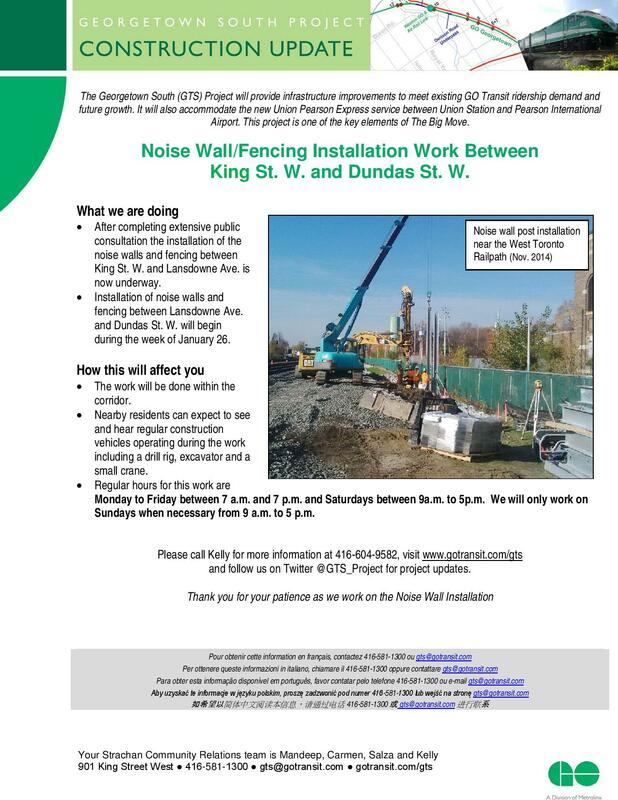 Please be advised that construction is underway for the installation of noise walls and new security fencing between King St. W and Lansdowne Ave. Installation between Lansdowne Ave. and Dundas St. W. is scheduled to begin later this month. Nearby residents can expect to see and hear regular construction vehicles operating during the work including a drill rig, excavator and a small crane. Regular work hours for this work are Monday to Friday between 7 a.m. and 7 p.m. and Saturdays between 9 a.m. and 5 p.m.
GO Transit will only work on Sundays when necessary from 9 a.m. to 5 p.m. This weekend, join the Parkdale Village BIA in celebrating 136 years of Parkdale. Earlier this morning I spoke with Matt Galloway on Metro Morning regarding the City of Toronto budget. 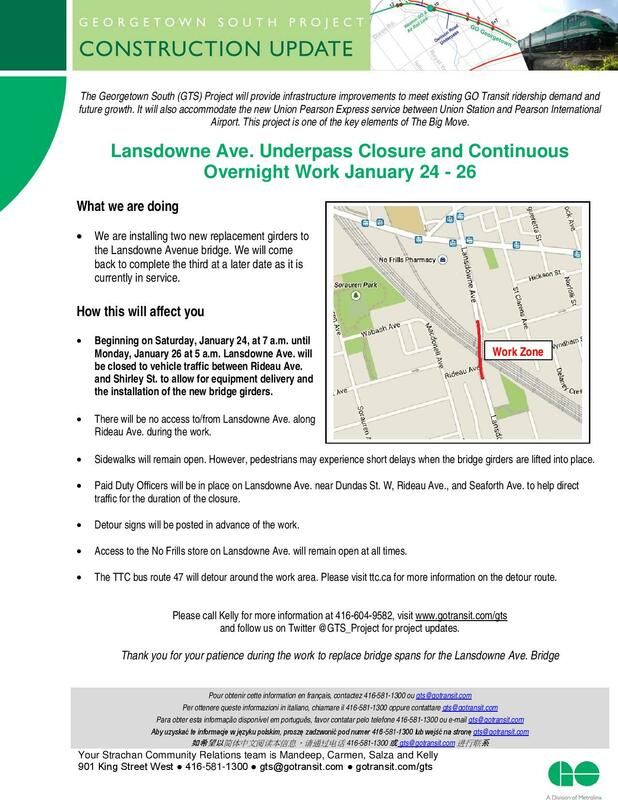 Beginning on Saturday, January 24, at 7 a.m. until Monday, January 26 at 5 a.m. Lansdowne Ave. will be closed to vehicle traffic between Rideau Ave. and Shirley St. to allow for equipment delivery and the installation of two new bridge girders. There will be no access to/from Lansdowne Ave. along Rideau Ave. during the work. Access to the No Frills store on Lansdowne Ave. will remain open at all times and sidewalks will remain open; however pedestrians may experience short delays when the bridge girders are lifted into place. Paid duty officers will be on site to help direct traffic for the duration of the closure. The TTC bus route 47 will detour around the work area. Please visit ttc.ca for more information on the detour route. 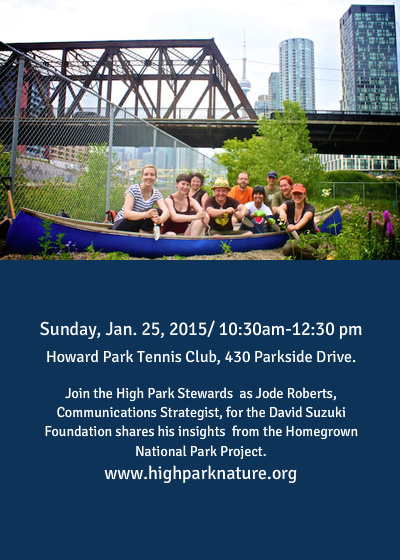 including the Homegrown National Park Project. brown building in the back.